With the 2018 fantasy football season in the rear-view mirror, NFL teams and fantasy gamers have shifted their focus to the 2019 NFL season. Every year backup running backs emerge over the course of a season, due to injury or poor play from teammates. Despite the mid-season role change, these backs, such as LeGarrette Blount and Giovani Bernard, often lose their nominal starter designations on the depth chart in free agency and the NFL Draft the following year. With the heart of the off-season approaching, advanced metrics point to a few running backs losing their respective roles. Once the prized possession of the Jacksonville Jaguars’ franchise, Leonard Fournette has fallen out of favor, due to multiple inefficient, injury-riddled season. Entering 2017 as Jacksonville’s work horse, Fournette averaged a lowly 3.9 yards per carry in 13 games as a rookie. In his second year, the former fourth-overall pick managed only 3.3 yards per attempt in eight games played. Fournette’s lack of explosion showed in multiple advanced metrics, including a 2.30-percent Breakaway Run Rate, which ranked fifth-worst among 37 running backs with at least 125 carries. His 3.2 True Yards per Carry also ranked third-worst among the aforementioned group. Taking a look at illusive and production metrics, Fournette also disappointed greatly in 2018. According to PlayerProfiler’s Juke Rate, Fournette’s 22.60-percent mark ranked 23rd among the group above. Similarly, Fournette’s -12.2 Production Premium ranked 23rd among qualified NFL backs. Not only was Fournette less efficient than his peers across the league, but T.J. Yeldon far out-produced him in the same offense, recording a Production Premium of +13.7. Finally, Fournette brings little upside in the passing game. While his 3.2 targets per game actually ranked near the middle of the pack, his 8.3 pass routes per game kept him far away from bell-cow status. Again, Yeldon out-performed Fournette in these metrics with 3.9 targets and 16.1 pass routes per game. 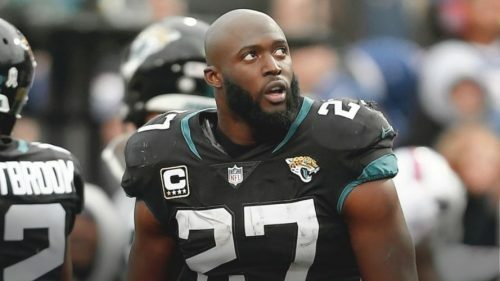 While replacing Fournette may seem crazy, Jacksonville could bite the bullet and move away from their sunk cost. At the very least, expect them to bring in a passing-down specialist to compliment Fournette’s inefficiency. Seemingly declining by the year, Jordan Howard recorded a career-low 935 rushing yards on 250 carries, despite appearing in all 16 of the Chicago Bears’ games in 2018. Predictably, Howard also saw his yards per carry drop for the third consecutive season, down to 3.7. Moving into the final year of his rookie contract, the Bears could look to replace Howard sooner, rather than later, with a competent early-down work-horse to compliment Tarik Cohen. With two seasons above 1,000 yards rushing under his belt, one could point to 2018 as a mere anomaly in a down year. However, Howard disappointed across the board in rushing efficiency metrics. Among 37 backs with at least 125 carries, Howard’s 3.60-percent Breakaway Run Rate, 10.70-percent Juke Rate, 3.6 True Yards per Carry, and -18.5 Production Premium all ranked within the bottom-12 among qualified running backs. Howard also disappointed in the passing game. With 1.7 targets per game on 7.1 routes per game, Howard finished 2018 as a non-factor pass catcher. After recording nine combined targets in his first two games, Howard saw no more than three targets in any contest the rest of the season, completely ceding all pass game work to Cohen. An inefficient, two-down grinder on an expiring contract, Howard remains one of the likeliest backs to find himself replaced this off-season. In classic Ravens’ form, Baltimore turned to UDFA Gus Edwards as their primary running back near the end of the season. As a 23-year old, undrafted rookie from Rutgers, Edwards entered the league with a 4.57 40-yard dash (55th-percentile), 105.0 Speed Score (78th-percentile), and a 120.2 Burst Score (58th-percentile). In only 11 games played, Edwards racked up an impressive 718 rushing yards as a rookie. With Alex Collins, Ty Montgomery, and Buck Allen all set to test free agency, Edwards sits atop the Baltimore depth chart. However, a few red flags pop up on Edwards’ profile in the run game. Looking at illusive metrics, Edwards finished the fourth-worst Juke Rate (14.40-percent) and the ninth-worst Production Premium (-20.2) among qualified backs. In conjunction with his 124 Yards Created (No. 53) these numbers indicate that Edwards failed to obtain extra yards on top of what his offensive line opened. In the same backfield, Kenneth Dixon recorded an impressive 48.5% Juke Rate and a +14.5 Production Premium. Edwards also finished near the bottom in all pass game metrics. Edwards ran a minuscule two pass routes per game, notching 0.2 targets a clip. Completely game script dependent, Edwards mere presence on the field tips a defense toward a run play. With little capital invested in Edwards to begin with, seeing the Ravens make a splash in free agency or the NFL Draft should not come as a surprise. Since signing a $26 million dollar contract, Lamar Miller has largely disappointed. 2018 marked the second-consecutive year Miller failed to reach 1,000 yards rushing, finishing with 973 yards. Now entering the final year of his contract, the Texans can cut Miller with only $1 million in dead-cap (saving an additional $6.2). Predictably, Miller struggled from an efficiency standpoint in 2018. His 20.4% Juke Rate (No. 42), 4.3% Breakaway Run Rate (No.32), and -14.6 Production Premium (No. 56) all ranked outside the top 30 at the running back position. He also failed to make an impact in the receiving game, notching only 11.3 pass routes per game and 163 receiving yards all season. Houston attempted to replace Miller once already, but a severe achilles injury put D’Onta Foreman‘s future in question. Look for the Texans to again test free agency or the NFLDraft to find Miller’s replacement. Heading into his age 31 campaign, LeSean McCoy finally showed signs of breaking down recording only 514 rushing yards in 14 games. Predictably, McCoy struggled in most rushing efficiency metrics, recording a 3.1 True Yards per Carry (No.66), a -26.1 Production Premium (No. 70), and a 3.1-percent Breakaway Run Rate (No. 47). While his offensive line provided little room to work, McCoy still created a mere 1.27 Yards Created per Carry (No.31). Similarly, McCoy’s pass routes per game fell to 9.6, despite the Buffalo Bills playing with a -4.75 Game Script (No. 29). Moving forward with young play-makers around Josh Allen, the Bills can move away from McCoy with only $2.6 million in dead cap money. Although the Bills have arguably the most needs in all of the NFL, seeing this wayward franchise spend valuable capital on a running back should not surprise anyone.